The Matte colours are really blendable and can be built up as well. They are so pigmented that they can serve as lid colours should you desire it. 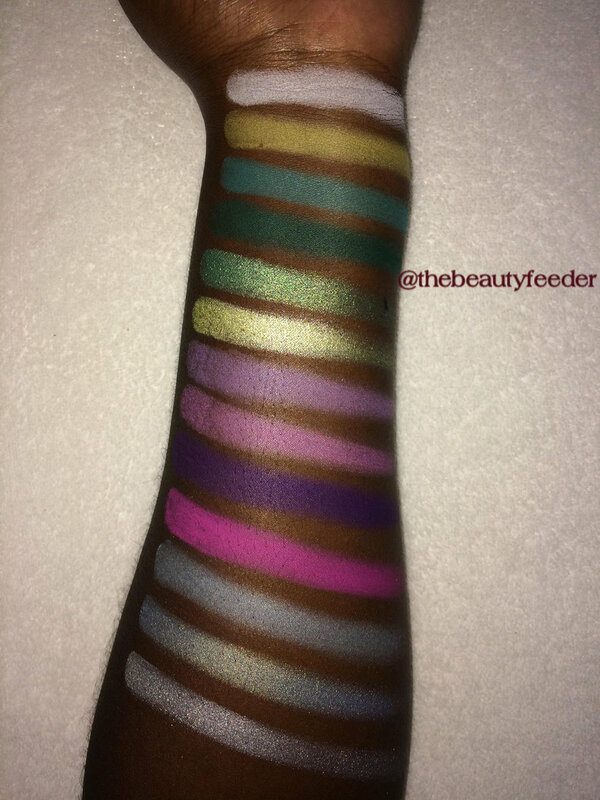 The Shimmer colours are the ones that will leave you shook! [You] don't need to swipe so hard to get enough pigment. The swatches in my post are two swipes, one swipe was enough to convince me, but I did two just to convince you of what you're treating yourself to. You wouldn't be disappointed if you treated yourself to this palette. Especially if you're someone that loves to play around with colors. The staying power of the shadows of this palette is incredible. The disadvantage to that is when taking off your makeup, using just soap and water doesn't cut it because you can have residual pigment staining your skin. So use makeup wipes instead. The one colour that won't show easily as a transition colour on the unprimed skin of a dark skinned lady is the yellow. So priming and setting your lid with just a brighter colour will make the yellow pop. The [shipping] packaging was awesome, it came within 5 days of my order and priority shipping. There wasn't a dent on the palette and I could tell from the colours that I was going to enjoy it so much. [That's] it for the Morphe 35S palette, I hope you found this helpful and interesting.